Harley Quinn utilizes lethal force in FATHERS OF THE DARK KNIGHT using an Army Surplus Rocket Propelled Grenade "Bazooka" Launcher. Naturally, the prop needed to be constructed from scratch to suit the needs of the production. The prop was constructed at Maidens of Mischief from standard PVC plumbing found in any housewares retailer. 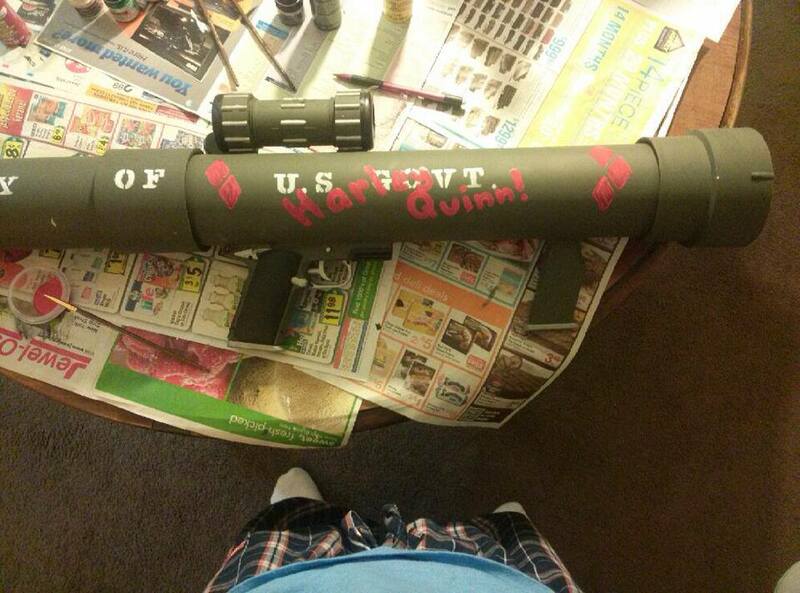 Mandy from "Maidens of Mischief" poses with the preliminary assembly of Harley Quinn's Bazooka! Bazooka Prop with trigger and stock assembled on. Final added detail of this exquisite prop are Harley Quinn's personalized graffiti markings! Harley Quinn truly enjoys her awesome BAZOOKA! !